I awakened this morning feeling fresh and renewed following a night of uninterrupted sleep. What a welcome relief after several nights of wakefulness. Last night God nudged me to pray as soon as my head hit the pillow. Sweet time with Him produced deep, peaceful sleep. Unfortunately, too often, once in bed, I give way to “thinking about things” before praying. When this happens my muscles tense and my heart beats faster and there I lie, captive to my thoughts. As stubborn eyes refuse to close, incessant mutterings in my head conjure up feelings of inadequacy, leading to dark and dangerous places. For years we have longed to share Hawaii with our extended family. Our love of the big island begged to be shared with loved ones. Our grandkids’ flight from the nest in a few short years would make fulfilling this notion more challenging. We just needed a little boost to begin turning our dream into a reality. 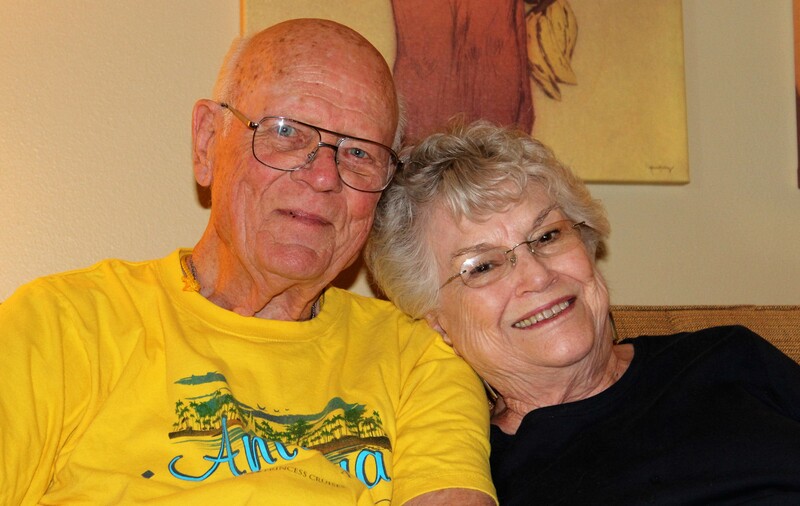 Marking my in-laws’ sixty-five years of marriage provided just the kick to initiate plans to convert our Hawaiian dream into a family adventure. 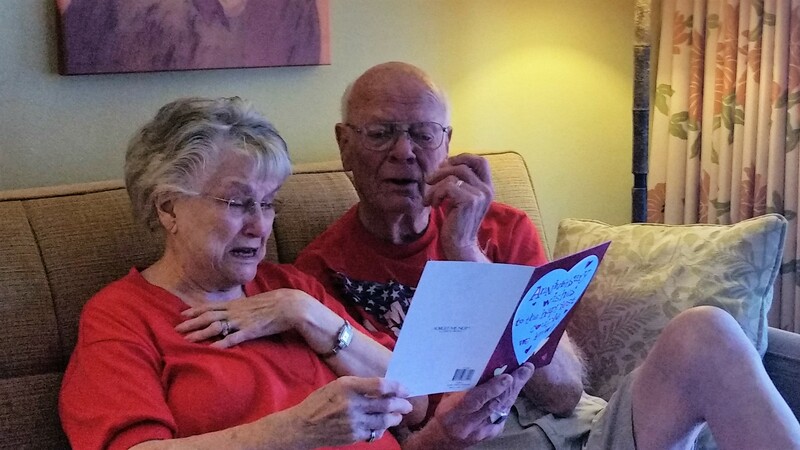 Sixty-five years of marriage! First of all, how does one achieve over half a century of togetherness and continue to treat each other with love and respect? If you ask her, she will quickly respond, “Commitment and humor!” Yep, commitment and humor everyday to maintain a relationship that endures. He is quick to agree, adding commitment to God as number one. Commitment has most definitely been evident, not only within their marriage, but also in their involvement in the lives of others. I have watched them care for others faithfully and unselfishly for years at a time. I have witnessed how God blessed them for their efforts. They weren’t in it for the blessings, but that is part of the surprise of a God who loves to make us happy and see us smile. It happens when we least expect it. It comes in many forms and even blesses those connected to the ones who did all the hard work. If you asked them, they would say it was blessing enough to just provide companionship and care to two elderly gentlemen who had no other family. When those two passed away, they left everything to my in-laws. I was the fortunate recipient of the Champion Juicer (way too expensive to have purchased on our meager income at the time.) What a treasure! That appliance has juiced many a Fall apple, even providing sustenance from the peels and pulp form my mulch pile. The pure enjoyment experienced by our family year round from those mason jars of frozen juice gives me pleasure to think about. Oh, the simple joys! Speaking of simple–these in-laws of mine tend to lead lives of simplicity. People of their generation, those who endured the Great Depression, continue in their frugal ways, even decades later. What to us would seem rather unappealing and cheap, to them is appetizing and adequate. 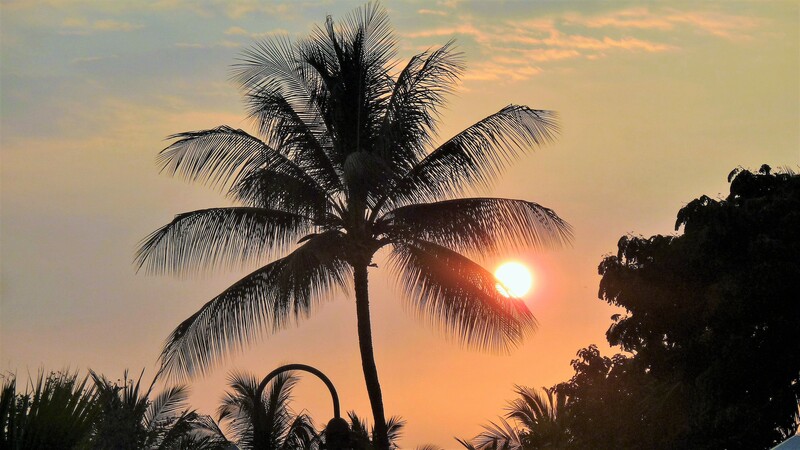 They shudder at the cost of a single entrée at a “restaurant with a view” in Kona. Even when they aren’t paying, they have difficulty finding true enjoyment in such extravagance. They are more than happy with our three-day-old grilled hamburger patties, deemed inedible by most of us. They are appreciative of the simple things and show that appreciation by telling you so. On the evening they left for the airport, my father-in-law, already weary from the late hour, came back because he forgot to personally thank me for all I did to make the week such a success. 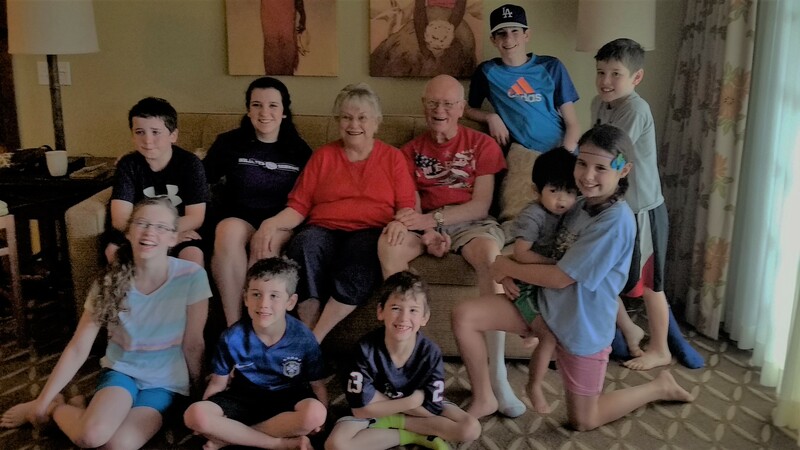 Their great-grandkids surprised them with a card (complete with signatures and drawings from little hands to big hands) everyday for six days. No gifts of stuff (they will tell you they have enough of that), just simple cards. Those Dollar Store cards containing such sweet sentiments brought immense joy and tears of gratitude flowed easily. The grueling trip to Hawaii and back home for these two, whose energy levels are far from what they used to be, was not easy. They are proud to say that they did it and feel extremely blessed to have done so. I’m sure our family would tell you that we are far more blessed for the opportunity to have honored this amazing couple known to all of us as Nonnie and Poppie. What a glorious time of year! Here in the Texas Hill Country, it hardly qualifies as Fall, compared to the ones our family knew and loved for twenty four years in Northern New Mexico. 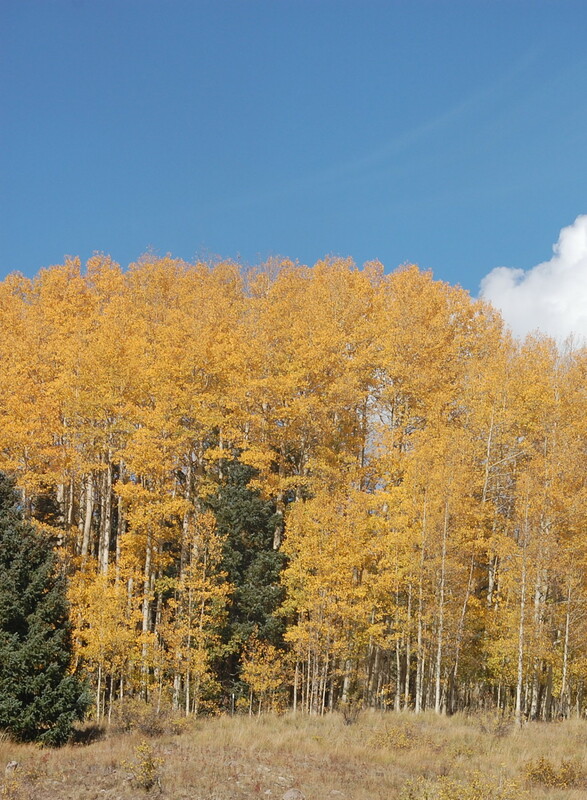 Ahhh….. How well I remember the sights, sounds, and feel of Fall in Los Alamos! 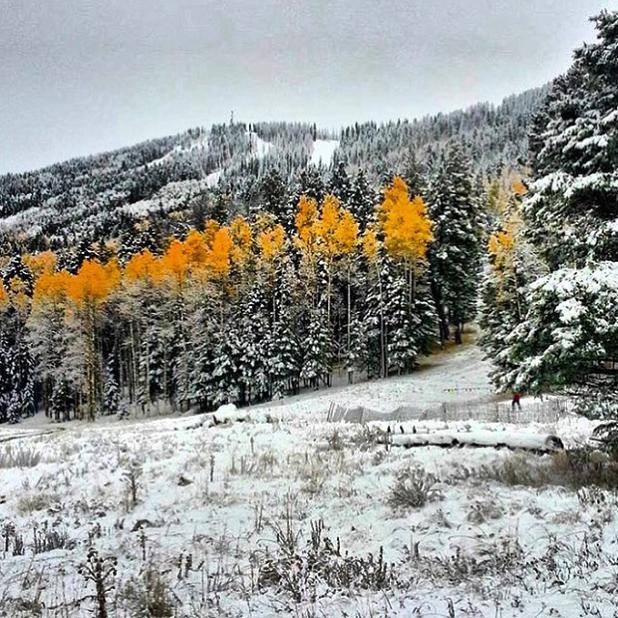 The tall, slender Aspen trees on the ski hill, golden leaves rustling in the wind, displaying their grandeur, invited those willing to take a break from daily routine. The air at over 8000 feet was brisk, even in September. Calmness flooded my soul as I sat on the deck of the lodge with a thermos of hot chocolate and a good book. The icing on the cake was watching the kids run up the grassy hill and roll down, pausing occasionally to examine one of God’s wonders that piqued their interest. Too soon this hill would be bustling with people, decked out with snow gear; some daring, ready to tackle the most difficult hill, while others, content to ski the bunny hill. But before the snow completely blanketed the slopes, I took advantage of soaking fup all the quiet, peace, and beauty that Fall brings to this special place. Already, this year, in early October there is snow on the mountain top and a dusting on the ground. The Aspens, peaking out between the Evergreens, put on quite a show. The sweet aroma of roasting green chile (we call it the nectar of the gods!) at the Thursday farmer’s market wafted through the air as I strolled down each aisle, lingering at my favorite stands. I sampled green chili jelly, hot apple cider, mango salsa. Yum! Inevitably I encountered friends, so it was important to allow time for a chat. In a small town you can’t go anywhere that you don’t see a familiar face. Oh, and I always had to buy a chile ristra for my doorpost. Even in August, evenings might find us sharing home-made ice cream around a fire pit with friends. Getting too far from the fire would nearly always guarantee the shivers. And then there’s the apples! What’s Fall without apples?! Eating apples, sweet and crisp, and baking apples with just enough tartness to make a good pie, were ready for picking by the end of September. Apple trees, preferring cool weather, grew well there. Since we had no apple trees in our yard, the elderly woman across the street generously allowed us to pick from her three trees. I canned, dried, froze, and juiced. Peels and pulp from juicing provided nourishment for worms in the outdoor compost pile. A large box dehydrator made its home in the dining room during this season, providing both warmth and divine apple fragrance (to rival Bath and Body Works Fall air fresheners any day.) Using our hand crank apple peeler/corer, much faster than using a knife, allowed us to process through many more apples in a day. This handy device provided lots of family fun and is a tradition that continues with our grandkids. Now, in mid-November, it finally feels like Fall in the Texas air, at least in the early mornings and late evenings, but not much evidence in the leaves or our 75 degree days. The Red Oak, one of the only local oak trees to lose its leaves, barely has a hint of yellow in its treetop. As I sat around an evening fire pit this past weekend with friends……. And as I take in the sweet smell of roasting chiles in front of HEB……. And as I smell apples baking……. If I close my eyes real tight and use my imagination I can almost feel like I am transported back in time to Northern New Mexico, experiencing the sights, sounds, and feel of “real” Fall. Stepping into a new season, be it seasons of weather or seasons of life, brings new changes. Not all are as glorious as those New Mexico Falls, but I am grateful for an unchanging God Who walks with me through it all.